Today's teens are more obsessed with diet and weight than any other generation. Adolescents are overwhelmed with messages in the media revolving around issues of weight, strength building and muscle mass. Our EatFit curriculum steers adolescents away from weight loss and dieting while directing their focus to a healthier lifestyle by developing a series of goals for the improvement of their eating and fitness habits. Students learn that through proper nutrition and physical activity they can improve their self-esteem, achieve more in school, and lower their risk for diabetes, heart disease and high blood pressure. 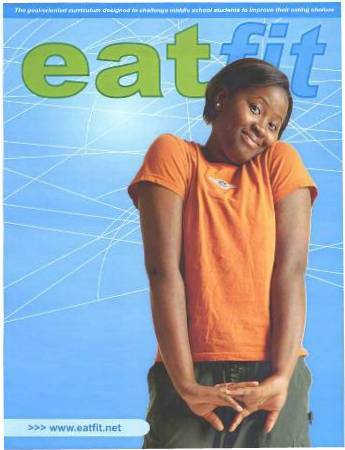 Designed specifically for 7th and 8th graders, the lessons include the basics of nutrition, web-based diet analysis, information about energy and calories, fast food and more. In addition, lessons and activities are correlated to content standards in math, science, and language arts. Each teacher who chooses to use the EatFit curriculum is provided a curriculum binder, along with workbooks for each student. 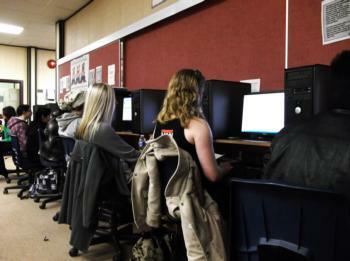 In addition, the curriculum is web-enhanced, allowing students to use and extend their computer skills within the classroom. G-going to do- positive action not inaction. Meaning goals should focus on beginning a set of behavior rather than stopping old behaviors. O-on target- specific rather than generalized goals should be made to eliminate any question of meeting one's target. A-attainable- realistic goals that consider time, complexity and other constraints eliminate discouragement and improve success. L-linked to other goals- minor short-term goals should relate to and advance the meeting of larger long-term goals. Visit the EatFit Website! to find student and teacher resources such as the online eating analysis, miscellaneous recipes, snack ideas, exercises, and previews of the student workbook, and curriculum. *Here you may also give feedback, suggest recipes and goals, ask for assistance or check your school qualification for the Eatfit curriculum.